Is everyone obsessed with squash right now or is it just me? I feel like every post I’ve put up this month has been squash. I have 5 varieties in my pantry right now. And as soon as I cook one, I run to the store to replace it. Just in case I have an emergency and need a sweet dumpling squash right now. So when I got a package full of Jennie-O ground turkey, I knew I wanted to make something with squash. You guys know that I love Jennie-O ground turkey. It’s my go-to protein for any meal. It cooks up super fast, it’s low fat and low calorie, and it tastes delicious. And it’s usually cheaper than ground beef at my stores which is a bonus. I have a breakfast salad almost every day of my life (I don’t know why I only eat salads at breakfast – I can’t explain how my brain works) and it’s always spring mix and whatever veggies I have, bacon, Jennie-O Lean Ground Turkey, diced cheddar, and bread and butter pickles. And then I drizzle it with honey mustard dressing. Please don’t stop reading after that confession. 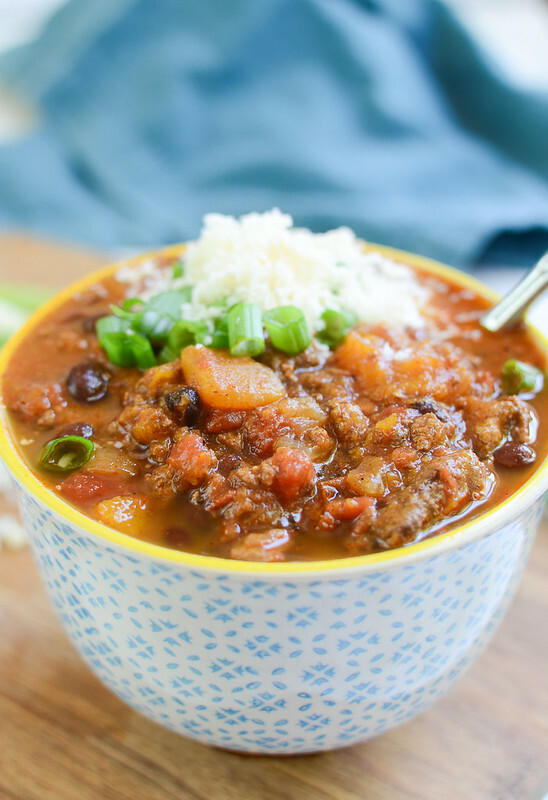 For this Slow Cooker Butternut Squash and Turkey Chili, I started by cooking up that Jennie-O Lean Ground Turkey and then tossed it in the slow cooker with onions, peppers, black beans, fire-roasted tomatoes, butternut squash, and all the delicious spices you need for a good chili! I love the black bean and butternut squash combo. Especially if it’s in something a bit spicy like this. It’s just so good. Plus the ground turkey? 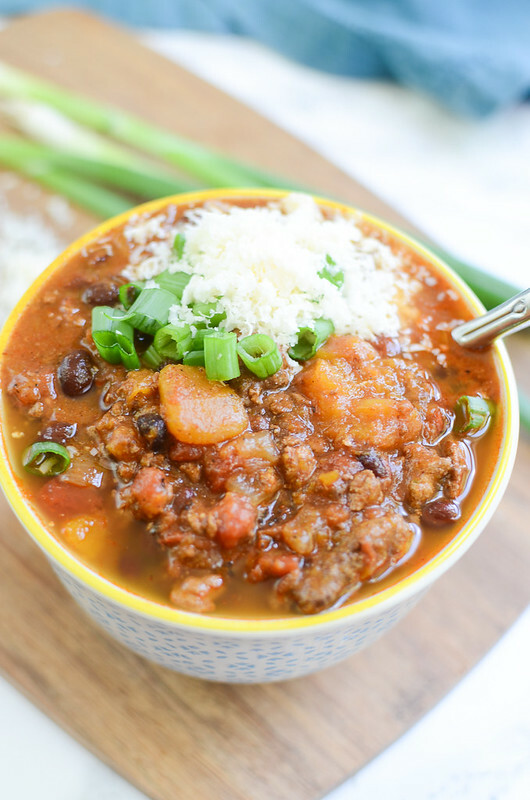 My ideal cold weather dinner! My kids happily ate it and didn’t even notice the squash. 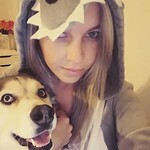 I did put theirs over tortilla chips though so. 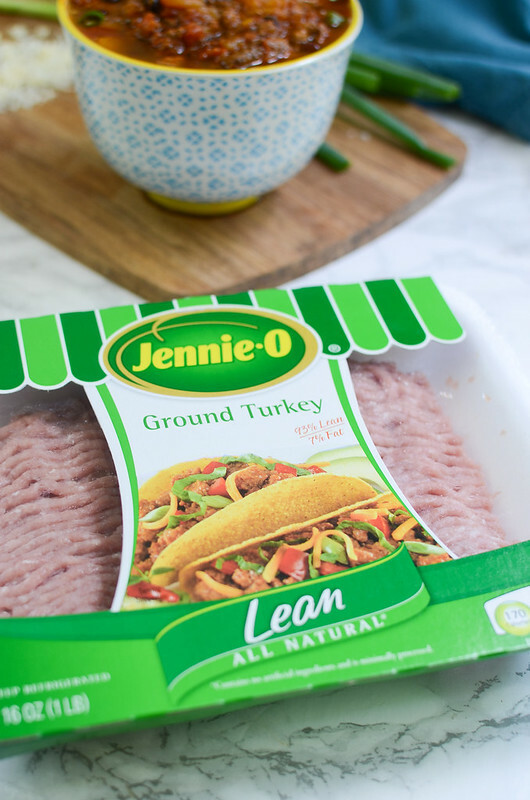 Let me know if the comments what your favorite way to use Jennie-O Ground Turkey is! Heat olive oil over medium-high heat. Add Jennie-O Lean Ground Turkey and cook, breaking it up, until no pink remains. Transfer to slow cooker. 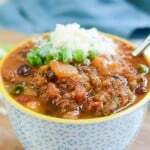 Add onion, green pepper, jalapeno, garlic, black beans, tomatoes, chili powder, cumin, salt, pepper, butternut squash, and chicken broth to slow cooker; stir to combine. Cook on low 8 hours or high for 4 hours. 30 minutes before serving, stir in 1 tablespoon of masa harina. If after 30 minutes, it still needs to be thicker, stir in the other tablespoon. Serve with shredded cheese and green onions, if desired. 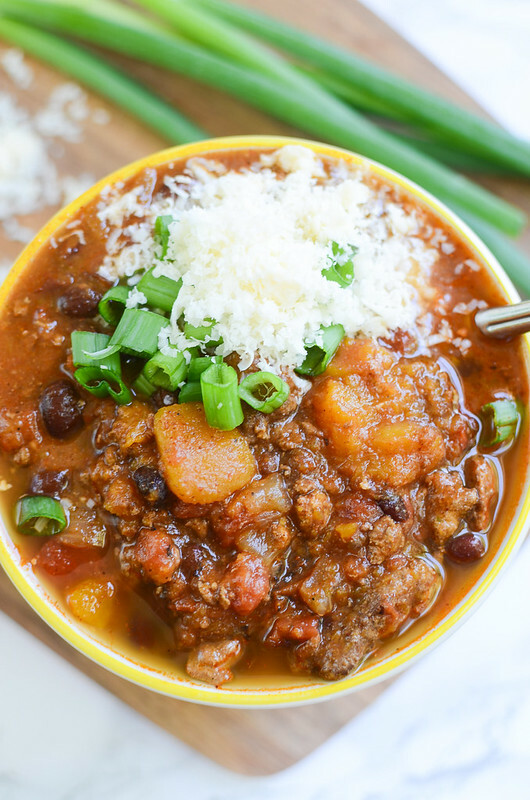 One Response to "Slow Cooker Butternut Squash and Turkey Chili"